We have an Inaugural Launch of this Product, Soon. Vist US! 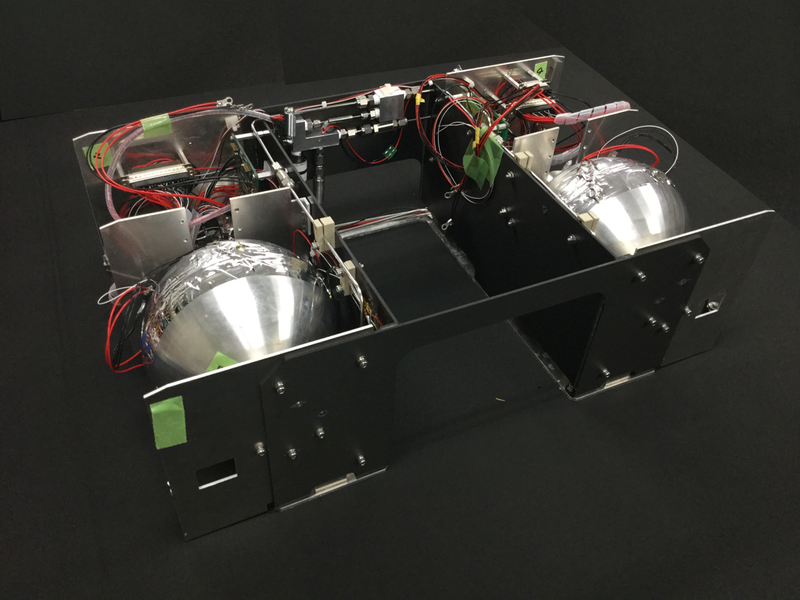 Brand new Spacecraft Subsystems Products were born from Hayabusa mission, the world's first Sample & Return mission from an Asteroid Itokawa in 2010. Contemporary small to micro satellites have emerged recently, and many of them successfully have demonstrated their performance especially photographing the earth surface, Earth observation. However, most of those satellites can only demonstrate stand-alone capability and never practical. If they are equipped with delta-V capability, they may constitute constellations and can perform practical functions and make business. Unfortunately, carrying propulsion system is not easy for them. 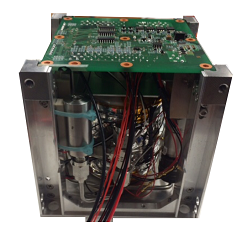 The biggest issue for small to micro satellites is in the propulsion system. Those low cost satellites cannot afford to pay for it, as the high performance in other words high temperature thrusters require sophisticated and special mechanics and material. Contemporary thrusters cost very expensive. This is the matter on the trade-off between performance/mass versus cost. Patchedconics presents one solution here. It is just a cold gas thruster, but is fabricated in very low cost manner. Cold thrusters usually carry their propellant in gas state. Therefore, the amount of gas carried is very much limited, and so far has only been applied to attitude control. The solution here carries propellant in liquid state, and the density of propellant is very high. The method is designated here High Density Cold Gas Jet (HDCGJ). Propellant gas is produced from its parent liquid in space. HDCGJ may sound a straightforward approach and seems easy. However, it is not true. Heating in most cases accompanies boiling that is very inefficient process with significantly degraded heat conductivity. Liquid is heated up and reaches liquid-gas equilibrium state as shown in P-T diagram on left. That equilibrium state gas is 100% humid gas or vapor, and it easily returns back to liquid again when a fraction of vapor is extracted and exhausted from satellites. The gas portion becomes full of mist and it is not usable for thrusting until the liquid is heated up more to reach another equilibrium state. This difficulty is circumvented in power plants on the ground by producing gas through supercriticality. 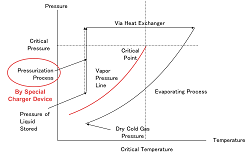 Water is first of all pressurized high beyond critical pressure and heat is applied. Supercritical fluid maintains high heat conductivity since no boiling occurs, and acquires high enthalpy. That supercritical fluid is expanded and dry gas is obtained efficiently. The process is shown on left. Is this directly applicable to satellites? The answer is no. 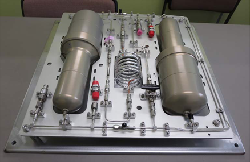 The pressurization requires a kind of pump device and usually heavy and consumes power. Japan Aerospace Exploration Agency (JAXA) developed a new and proprietary idea that does not assume pump onboard at all. The device consists of two pistons and cylinders of different diameters. 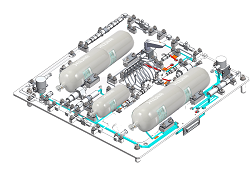 Gas produced from heat exchanger pressurizes its parent fluid beyond critical pressure with no power. It is called self-pressurization. A schematic CAD drawing is presented on left. Patchedconics, LLC is a corporate that disseminates JAXA-developed technology including this globally. The real engineering hardware was built (Photo without/with thermal insulator). And the vacuum chamber test was performed successfully. This is called Model-A carrying 1kg propellant and exhibits 400Nsec impulse continuously. 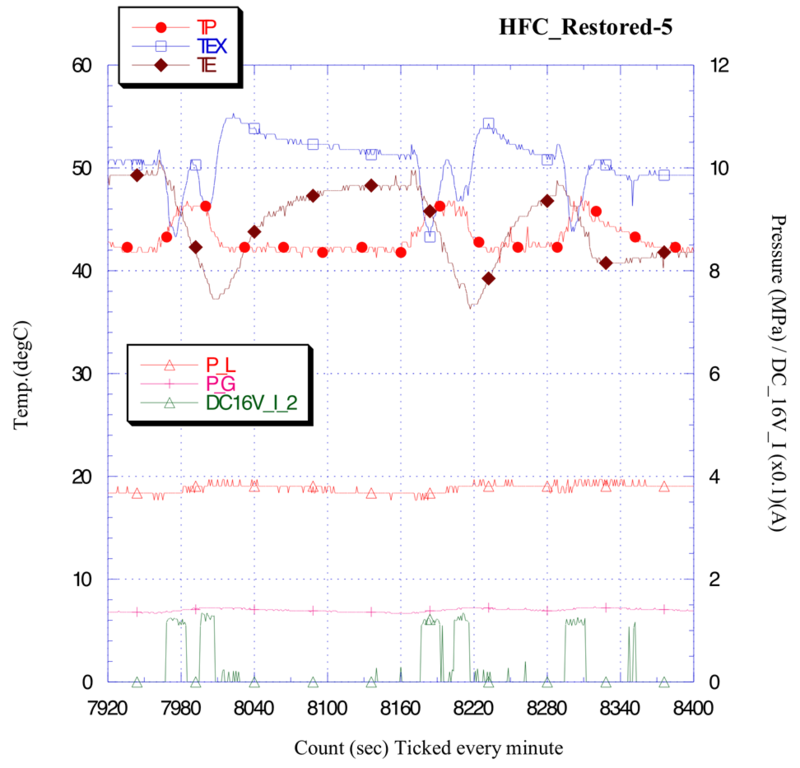 The supercritical maintenance is possible even at zero degC. The system mass excluding panel weighs approximately 3kg (dry). 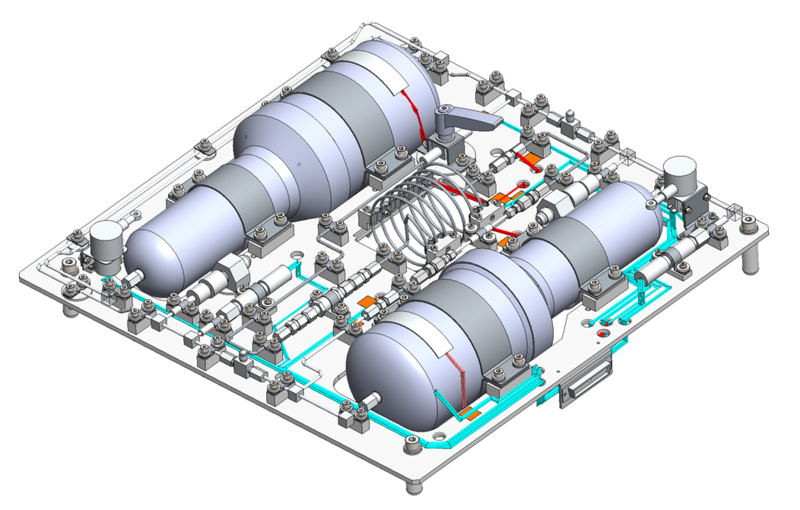 The test results example is presented also on left, and it shows gas container is always pressurized for thrusting. Supercritical is well maintained with low power about 30-40W on average for 100mN thrusting. Thrust is tuned for applications. Depending on the tank or vessel sizes, the amount of impulse is tunable. This engineering model has relatively conservative impulse. 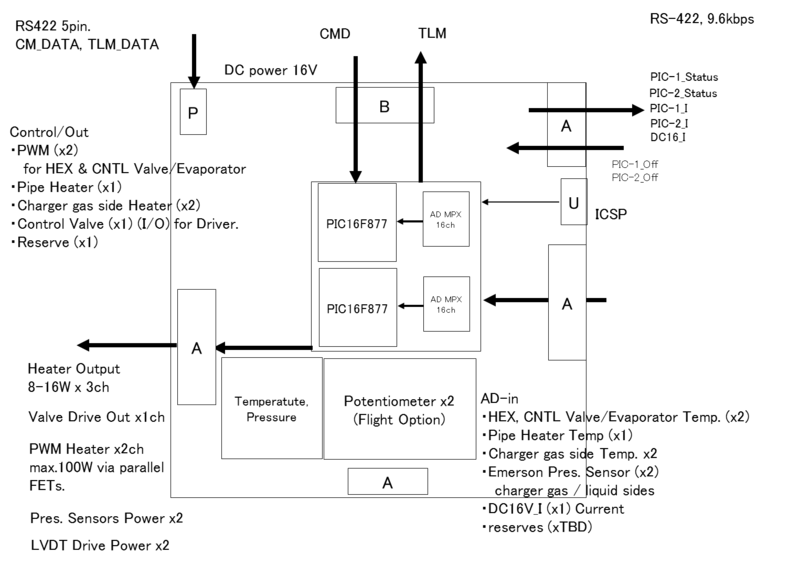 The typical micro satellites assumed here are 50kg class satellites as shown on left. In case only constituting a constellation does not require large impulse. Several meters per second suffice that purpose. 400Nsec corresponds 8 m/s for 50kg satellites. In case those are on 550km altitude orbit when F10.7 flux is 150SFU on average, and also in case inverse-ballistic parameter is 0.01 m2/kg, 10 years constellation maintenance costs 2500Nsec impulse. This corresponds to 6kg propellant in our system. It is heavy, however, is built in very low cost way. 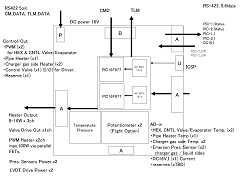 Patchedconics at the same time developed driver circuit PCB for this purpose. 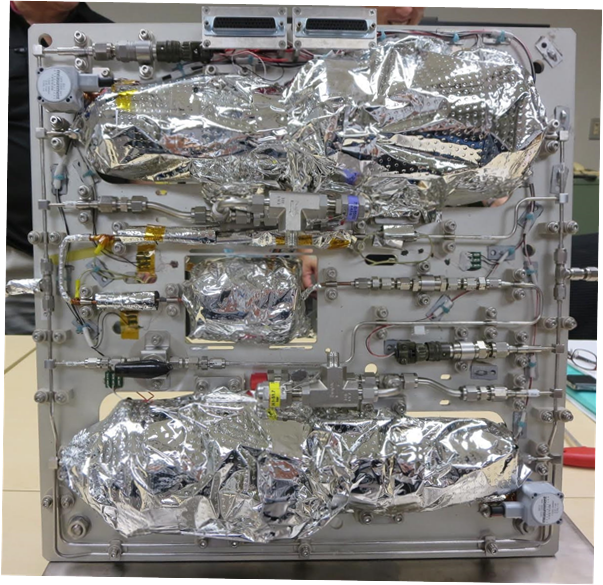 It handles everything including heater and heat exchanger control, pressure regulation and telemetry and command shaking with the main spacecraft bus. It carries double microprocessors that have been flown. 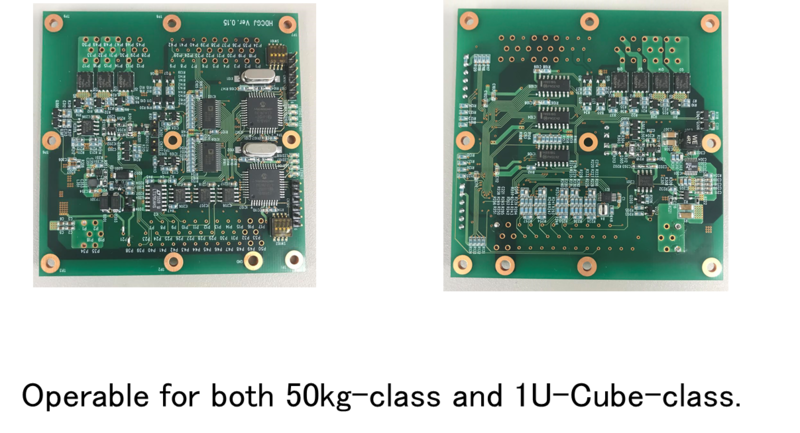 The PCB size is 85mm x 85mm and fits for 1U size panel. The block diagram and actual PCB photos are available on left. Click for larger images. The gas generator and PCB are ready for production and deliverable according to customers’ requirement within half a year from order. Price/cost is inquired and replied via e-mail or web inquiry form of this web page. 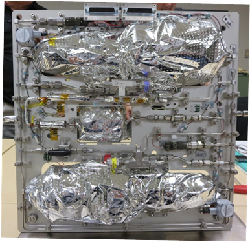 Patchedconics and JAXA built 1U all-in-one HDCGJ propulsion system hardware this year as well. 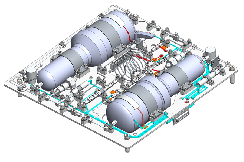 The CAD image is presented on left. 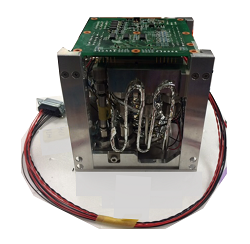 It is a little different device using energy harvesting inside a satellite to maintain supercriticality. Supercriticality is maintained above 20 degC temperature. This fits for 100mm x 100mm x 100mm 1U box. The mass weighs 1.4 kg dry. The real images together with a PCB are presented on left. The propellant amounts 150gram produces 60Nsec impulse. A PCB goes to one panel. 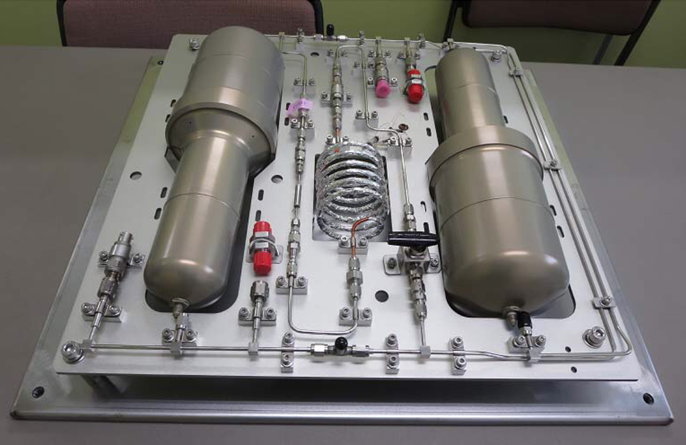 This year, gas generator portion was built and tested under vacuum. The test was very successful. Fabrication of thruster module is left for fabrication waiting for customers’ requirements. Propellant container is auxiliary increased if the volume is more available. 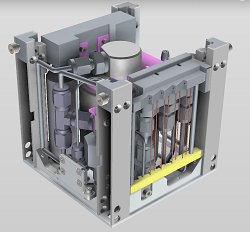 This product is currently built via connectors and brazing design completes in the middle of 2018, when Patchedconics can take order and ready for fabrication within half a year. Patchedconics plans to develop Model-B and Model-C HDCGJ for 50kg class satellites by March of 2018. It is also energy harvesting device and can carry more propellant. The typical Model-B HDCGJ carries 6kg propellant and exhibits 2500Nsec impulse. It fits for 10 years constellation operation on 550km altitude. Model-C follows it and appears in fall of 2018. It carries its proprietay 'Fluid Piston' device that pressurizes propellant beyond critical pressure. The biggest advantage in Model-C over Model-B is in that lower temperature operation is enabled by Model-C, compensating energy harvesting. 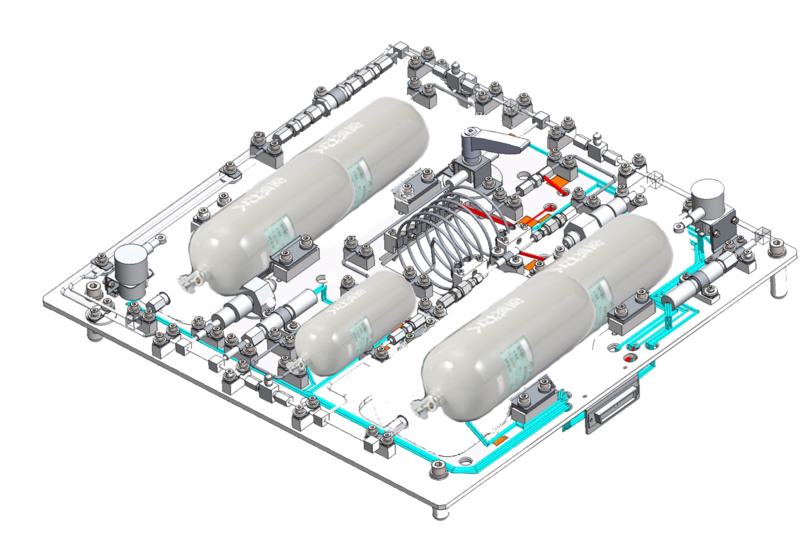 The latest system adopts Model-C configuration that assures liquid-to-gas separation and guarantees liquid provision of propellant to heat exchanger aboard. The strategy adopted is based on JAXA (Japan Aerospace Exploration Agency) proprietary technology. The fabrication of the system is being completed and awaits for the flight soon. Business meetings are available at Japan booth.